In this video, Jordan Behan invites all guests of Couch Beers interviews to come back and sit on the couch. The topic of the day was Mobile Media making with cellphones. Guests included Roland Tanglao, Dale McGladdery, Hendrik Beune and April Smith of AHA MEDIA. The episode was beling livestreamed and was projected onto a large screen during the interviews. AHA MEDIA took trip to La Casa Gelato near Commercial Drive in Vancouver http://www.lacasagelato.com/. We wanted to treat ourselves after working very hard at Vancouver Digital Week doing livestreaming, live twitter, mobile new media photography and videography with our social media connections. Here is a photo of Peter Davies trying to “tweet and eat” at the exact same time. 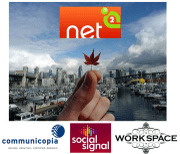 Net Tuesday – Mini Social Media Camp for Non Profits and Other Do Gooders! Mini Social Media Camp for Nonprofits & Other Do Gooders! The next Net Tuesday is being organized by Elijah van der Giessen of the David Suzuki Foundation! Eli is rocking a whole new breed of Net Tuesdays – Imagine a mini social media camp where you can learn about & discuss the social media and tech tools that can rock your nonprofit/org/project! How can my organization use Facebook to be more awesome? Should I use Pages or Groups? How can I use Twitter to find new supporters? How can I use Ning to build a community? How can I use free tools to power my online petitions? In this video, Dale McGladdery of http://www.group42.ca/ talks about Open Web Vancouver Conference http://www.openwebvancouver.ca/ during Net Tuesday April 28th, 2009 at Workspace in Gastown. In this video, Lorraine Murphy of Raincoaster Media http://www.raincoastermedia.com talks her teaching social media and blogging for beginners classes during Net Tuesday April 28th, 2009 at Workspace in Gastown.